West Brom came from behind to inflict a fourth straight Premier League defeat on struggling Bournemouth in a captivating game at The Hawthorns. Joshua King's calm penalty put the visitors ahead on five minutes after Allan Nyom had clumsily wrestled Ryan Fraser to the ground inside the area. Craig Dawson equalised at the end of a thrilling first 10 minutes as his strike took a big deflection off Charlie Daniels as Artur Boruc dived in vain. Boruc's woeful error in failing to punch clear a corner allowed Gareth McAuely to put his side in front on 22 minutes, with the Cherries' recent defensive woes routinely exploited by the hosts at set-pieces. Nacer Chadli's header was rightly disallowed for offside after the interval, while Dawson was forced off after appearing to be knocked unconscious in the build-up - West Brom later stating the defender is fine following his collision with Tyrone Mings. Despite dominating possession, Eddie Howe's side failed to find a vital equaliser - Ben Foster making two superb saves in added time to ensure Bournemouth continue their slide into a relegation battle. 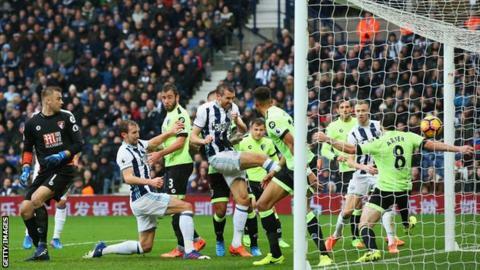 For the hosts, substitute James McClean also saw his effort well saved by Boruc late on, as the impressive Baggies have now reached 40 points for the season. Barring a remarkable downturn in form, West Brom look firmly on course to achieve their best-ever Premier League points total this season. Their current record stands at 49 when the Baggies finished eighth at the end of the 2012-13 campaign under Steve Clarke, but have 12 games remaining to surpass that total. Clarke's side had the benefit of Romelu Lukaku's 17 league goals that year, whereas this vintage have a more unlikely source in 37-year-old centre-back McAuley, who looks keen and capable of playing to 40 in his current form. The veteran capped his 500th game in English football with his seventh strike in all competitions this season - drawing him level with Salomon Rondon as West Brom's top scorer - before marshalling his defence expertly in a tighter second half. In truth, he will likely never score an easier goal as Boruc suffered the indignity of managing to punch the ball behind him from a corner before it rolled down his back and into McAuley's path. The hosts were fortunate with Dawson's deflected leveller too, but that should not detract from another fine performance as they claimed a fifth victory in their last eight league games. The plot points were different but this was an all-too familiar tale for Bournemouth as their miserable defence once again made sure they remain without a win in 2017, having now conceded 18 goals in their last six Premier League games. Daniels' deflection was unlucky but Dawson should never have been allowed the space to move up from right-back unchecked into a shooting position. Bournemouth looked petrified every time they conceded a corner - the hosts had eight in total - as Jonny Evans, Dawson and McAuley all tormented their marker, with the latter also hitting the crossbar from a looping header. As woeful as the visitors looked at set pieces, they also took bizarre risks in open play, Steve Cook perhaps lucky to avoid a red card as he barged Rondon off the ball as the striker threatened to beat Boruc. All this makes the club's failure to bring in any more defenders in the January transfer window even more puzzling, while Nathan Ake's departure back to parent club Chelsea hangs like a curse over Howe's beleaguered side. Andrew Surman and Harry Arter also failed to provide the protection that Jake Livermore offered for the hosts, while in Boruc, the Cherries have a goalkeeper whose performances grow evermore inconsistent. In contrast to Boruc's dismal showing, West Brom keeper Foster had little to do until two excellent saves in added time. The first was somewhat straightforward as he stayed tall to flick substitute Lys Mousset's curling effort over the bar with his right hand. The second saw him scramble across to his right, just managing to tip Mings' glancing header behind. Surman also failed to test the Baggies keeper when well placed late on as Bournemouth created more chances in the final five minutes than the preceding 45, but three points was due reward for Foster's efforts. West Brom boss Tony Pulis: "It's a great achievement to get 40 points by this time, so we're all pleased. "It's been a great season so far, but we don't want to let it go flat. "Look at Claudio Ranieri and Leicester - as soon as you become complacement, this game has an unbelievable way of kicking you up the backside." Bournemouth boss Eddie Howe: "I thought we did enough to get a point during the whole game - we dominated possession but perhaps didn't do enough with that. I'm disappointed. "When you're not wining games there are errors from the team - it's not one person, we need to take collective responsibility. "If we come back from this - and I'm sure we will - then we'll be a much better team for it. "Destiny is in our own hands and we've got to force it our way." Ex-England captain Alan Shearer: "Another individual error from a Bournemouth player, this time the keeper, gifted the goal to Gareth McAuley. It has happened too many times this season. There's a bit of traffic but that's no excuse for that. West Brom are a threat but Boruc has to do better. It's a simple chance and it's gifted them a goal. "West Brom are having one hell of a season. The team have been brilliant for Tony Pulis." Tony Pulis has seen a side under his management reach the 40-point mark in February within the Premier League for the first time ever. Craig Dawson's goal was the first scored for WBA in the Premier League by an English player since April 25th 2016 (also by Craig Dawson). Ryan Fraser has won a league-high four penalties this season in the Premier League. Bournemouth have scored three penalties in the Premier League in 2017 already - all coming in the opening 20 minutes of games. Gareth McAuley has scored in successive Premier League appearances for the first time in his career. In fact, it's the first time he's scored more than once in a month within the competition. Artur Boruc has made seven errors leading to goals in the Premier League since the start of 2015-16; more than any other player in this period. Only Leicester City (1) have collected fewer Premier League points in 2017 than Bournemouth (2). West Brom host Crystal Palace at The Hawthorns on Saturday 4 March, with kick-off at 15:00 GMT. Bournemouth travel to Manchester United on the same day, kicking-off at 12:30 GMT. Match ends, West Bromwich Albion 2, Bournemouth 1. Second Half ends, West Bromwich Albion 2, Bournemouth 1. Corner, Bournemouth. Conceded by Ben Foster. Attempt saved. Tyrone Mings (Bournemouth) header from the centre of the box is saved in the top left corner. Assisted by Ryan Fraser with a cross. Attempt missed. Andrew Surman (Bournemouth) header from the centre of the box misses to the left. Assisted by Ryan Fraser with a cross following a corner. Attempt saved. Lys Mousset (Bournemouth) right footed shot from outside the box is saved in the top centre of the goal. Assisted by Charlie Daniels. Attempt missed. Joshua King (Bournemouth) header from the centre of the box is high and wide to the left. Assisted by Adam Smith with a cross. Attempt saved. James McClean (West Bromwich Albion) left footed shot from the left side of the box is saved in the bottom right corner. Assisted by Salomón Rondón with a through ball. Hand ball by James McClean (West Bromwich Albion). Attempt missed. James McClean (West Bromwich Albion) left footed shot from the left side of the box misses to the right. Assisted by Salomón Rondón. Jonny Evans (West Bromwich Albion) wins a free kick on the left wing. Substitution, West Bromwich Albion. Sam Field replaces Nacer Chadli. Substitution, Bournemouth. Lys Mousset replaces Marc Pugh. Attempt blocked. Marc Pugh (Bournemouth) right footed shot from outside the box is blocked. Assisted by Benik Afobe. Corner, West Bromwich Albion. Conceded by Steve Cook. Foul by Nacer Chadli (West Bromwich Albion). Corner, Bournemouth. Conceded by Nyom. Attempt blocked. Steve Cook (Bournemouth) right footed shot from outside the box is blocked. Assisted by Adam Smith. Corner, West Bromwich Albion. Conceded by Joshua King. Corner, West Bromwich Albion. Conceded by Adam Smith. Substitution, Bournemouth. Dan Gosling replaces Jack Wilshere. Substitution, Bournemouth. Benik Afobe replaces Harry Arter. Offside, West Bromwich Albion. Jake Livermore tries a through ball, but James McClean is caught offside. Attempt blocked. James McClean (West Bromwich Albion) left footed shot from outside the box is blocked. Assisted by Darren Fletcher. Attempt missed. Harry Arter (Bournemouth) left footed shot from outside the box misses to the right. Assisted by Joshua King. Attempt blocked. Salomón Rondón (West Bromwich Albion) left footed shot from the centre of the box is blocked. Assisted by James McClean with a headed pass. Substitution, West Bromwich Albion. James McClean replaces Craig Dawson because of an injury.